We live in a technological world. Understanding the relationship between man and technology is therefore more important than ever. 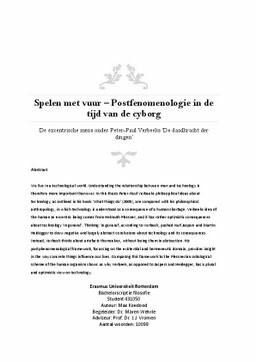 In this thesis Peter-Paul Verbeeks philosophical ideas about technology, as outlined in his book ‘What things do’ (2005), are compared with his philosophical anthropology, in which technology is understood as a consequence of a human shortage. Verbeeks idea of the human as excentric being comes from Helmuth Plessner, and it has rather optimistic consequences about technology ‘in general’. Thinking ‘in general’, according to Verbeek, pushed Karl Jaspers and Martin Heidegger to draw negative and largely abstract conclusions about technology and its consequences. Instead, Verbeek thinks about artefacts themselves, without losing them in abstraction. His postphenomenological framework, focussing on the existential and hermeneutic domain, provides insight in the way concrete things influence our lives. Comparing this framework to the Plessnerian ontological scheme of the human organism shows us why Verbeek, as opposed to Jaspers and Heidegger, has a plural and optimistic view on technology.